cause big problems (stress) to the structure of the entire body, primarily lower back and hip problems. 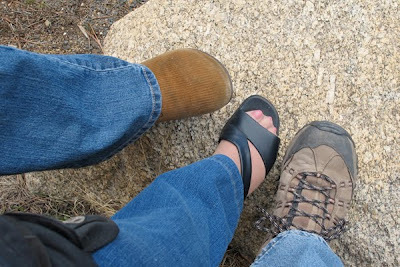 Bunions and bone spurs are telltale signs that proper footwear has been ignored. Her is a good rule to remember: When fashion overrides function, it spells trouble for the feet. Without naming names, there are many shoe brands on the market today, which look cool and may even feel great initially, but offer no support to the feet and may cause serious structural damage down the road, not just to your feet, but your knees, hips and lower back. Indeed, your feet are made for walking and using them for this purpose is a great way to reduce stress as well. If you have lower back pain, or pain in the hip, knee or ankle joint, very likely it’s your feet that have been ignored. Please consider making an appointment to see a podiatrist (foot doctor). It might be that what you need are orthodics, followed by a good pair of shoes. Also… consider a good foot massage (reflexology) every now and then. 15-30 minutes on each foot is nothing less than heaven. Once again, I would love to direct your attention to the Walking With Walgreens website which is promoting wellness through walking. There are many blog entries (including a few I was asked to contribute) for this website. Enjoy! Photo of the Day: My Godmother, Pat O’Connor, (and her daughter and granddaughter) came out to visit me last week here in Colorado. We went up to Estes Park and Rocky Mountain National Park in the hopes to see some wildlife (which we did; a coyote, some deer and LOTS of elk). Somehow the girls all missed the memo about bringing good walking shoes so our tour of the park was primarily by car. All is all it was a great visit.